The Didi Galgalu is a large powerful knife. It would look good for a display or can be used for those tough cutting jobs. Whether you're hunting or camping it will be sure to come in handy. This knife was designed with the voetspore team of south africa. This means it its made to withstand the harsh environments and jobs it would have to be put though there. The Handle is made from a African Kiaat and Vulcanfibre. Measuring in at 4.72" the handle is very comfortable to hold even during tough jobs. The Rivets help to reinforce the knife as well as increase the aesthetics. The groves on the handle allow you to get a strong yet natural grip and reduce the chance of injury. This powerful knife uses a 5.08" blade. Forged from Sandvik 12C27 stainless steel, the blade is ready to take on any job. The sharp blade can slice though materials making it ideal for hunting or camping whilst the point can pierce materials. 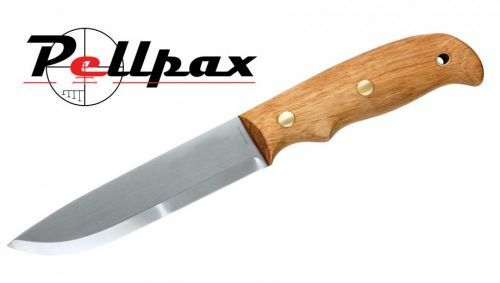 This top quality knife comes complete with a genuine leather sheath. Add this item to your basket & spend an extra £317.01 to apply for finance.